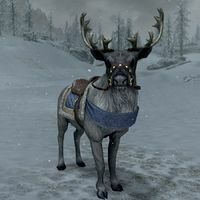 The Reindeer is a unique mount found at a camp north of the Windward Ruins. It can be bought by purchasing a bill of sale from its current owner, Agrane Peryval. It functions identically to a horse mount but in appearance it resembles a deer wearing festive tack. It will return to Agrane's camp if you switch to a different active mount. This page was last modified on 20 January 2019, at 19:51.